Erdrique (Level 16 Bard) and Sttollen (Level 17 Rogue) (I run these two together)-they picked up 11 keys so far. Now one thing you can definitely see is that during this past week or so, my quest runs have been primarily with characters in the level 15 to 17 range. Since Erdrique and Sttollen I tend to play much more often, it makes sense that they have gathered more keys than my other characters. However, I was surprised to see how many keys Izmit picked up. I don’t play Izmit that often, but his two spiked chain attacks are quite effective in the graveyard. Izmit taking down some undead in the graveyard to get keys. Now there are many different factors that can affect the drop rates for keys. The number of monster spawns in the area, whether or not you are grouped in a party, if you are grouped in a party how big the the party is, how many monsters you or your party are killing, and the amount of time you spend running in the graveyard. A better metric for this would have been to calculate a key per hour (or some other time amount to quantify effort) for each character and even taking into account your party size and monster kills. Now for some of these runs I spent more time in the graveyard while others I spent more time in the Night Revel quests (since I just banked the keys I just switched them from character to another). We still have another week with the Night Revels so I’ll be curious to see how many keys some of my other characters will pick up. I’m my schedule holds true, I plan on running a few more lower level characters this week as well as some epic level characters along with Erdrique and Sttollen. Thanks for reading everybody and happy hunting in the Night Revels!! My primary character, Erdrique, is slowly making his way through the path to heroic completionist. As such he has completed paladin, fighter, ranger, cleric, druid, monk, and rogue lives. Although he will finally end his “career” as a paladin (my favorite class) he still has a long way go. Currently, Erdrique is making his way through a bard life with a primary focus on the Warchanter prestige enhancement line. Erdrique is currently level 16 (with level 17 “banked) and as such he picked up the majority of abilities in the Warchanter line. One of the reasons why I decided to take Erdrique down the Warchanter path was because I felt it fit my play style more than the Spellsinger or Swashbuckler. Another reason is that I also have another bard who is primarily focused on the Spellsinger path. But, overall, I tend to favor more melee oriented characters. I even tend to wade into the melee action a little more than I should with my casting characters. With that said, the Warchanter tree just seemed to have a number of unique abilities that seemed fun to use in traditional melee combat. Erdrique prepping for battle in the Tomb of the Astrologer. These abilities primarily include those that add ice damage to your attacks (Iced Edges, The Frozen Fury, Northwind, and Spinning Ice). These particular abilities give your character a fun little twist by allowing to freeze some enemies in their tracks giving your melee character to add a little bit of crowd control as well as some extra damage. However, the real power of the bard is the ability for it to add a number of buffs to themselves and their party members by using their spells and songs. The Warchanter tree continues to augment this ability with abilities such as Song Heroism, Skaldic Rage, Fighting Spirit, Boast, and a number of others. These abilities all give some small bonus to various abilities allowing your character to be more effective in combat (and in many cases adding some of these to your party members as well). So far, I have found these to couple my play style quite well. We’ll see how I feel once I get Erdrique into the epic levels. Of course the epic destiny Erdrique left off on isn’t the best for a Warchanter bard but hopefully it won’t take me too long to move out of it and into a destiny that is more complimentary. In any case, I have found the Warchanter bard to be a fun class to play. It tends to augment my playing style quite well. If you haven’t tried to play a Warchanter bard and you like to be a melee combatant, I would recommend giving it a try. Awhile back, I wrote a blog about the quest Diplomatic Impunity. In that original blog post (sorry about the pictures being blocked 😦 ), I wrote about the general characteristics of the quest and some of it’s unique characteristics: the ability to parlay with the wildmen, watching the invasion force make it’s landing, and the end fight. This time I want to focus a little bit more on the various types of enemies you will encounter while you make your way through the jungles of the Skyfall Coast and to the ruins that Droaam is using as their initial staging area. When you first set out in the quest, the first things you will most likely encounter will be the native creatures of the Skyfall Coast: scorpions, panthers, and wild men. In many instances you can avoid the scorpions if you wish. The scorpions are hidden in their underground burrows and will spring up to attack when you travel over and through them. The clearings that mark these locations are generally pretty evident. There does appear to be a named scorpion (Needleclaw), although I don’t think I have ever encountered him (I will have to check my monster manual on that one). Avoiding the panthers and wild men is a much different story. Unless you have a very good sneak ability or invisibility you will most likely have to combat some of these creatures. There is a possible named panther (Bashevis) that you can defeat as well. Both, the panthers and wild men tend to stay in their own groups, which makes fighting them challenging at times. When you run across a pack of panthers, you can expect to be tripped a couple of times and when you run across a group of wild men, you can bet their will be a shaman among them creating a wealth of havoc for you. Erdrique and his group taking on one of the scorpion nests in Diplomatic Impunity. After you make contact with Ullevian and observer the Droaam forces making their landing is when you will have to start dealing with those particular forces. The majority of the Droaam forces are clustered in groups spread throughout the rest of your pathway as you make your back to the ruins where Ilos Hrolk has made his lair. Each skirmish tends to have two gnolls, one warpriest and warmage, a couple of half-orc archers (skirmishers), a couple of melee (including orc infantry soldiers and half-orc conscripts). If you don’t take out the warpriests and warmages relatively quickly, things could get messy. Ilos Hrolk, is a half-orc fighter and is quite a brute. During your end fight with him, we will keep bringing in reinforcements to help him and the whole scene could get pretty hectic rather quickly. Couple that with some miscellaneous traps to catch those parties who try to retreat and regroup, it does get interesting. Overall, the enemies in here can be quite challenging. Although the diversity isn’t large, their makeup allows for some interesting synergy between them and makes your attacks on them more disciplined. If you haven’t explored Diplomatic Impunity, go check it out. Thanks for reading everybody and happy hunting in the Skyfall Coast!! Who Controls the Night Revels? 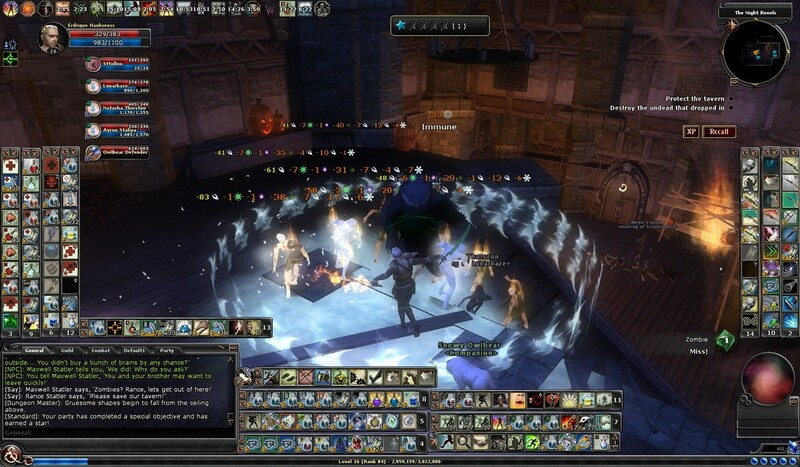 The Night Revels is a popular event in DDO. It occurs during the Halloween Season and takes place entirely in Delera’s Graveyard. The event consists of undead constantly rising up from the grave in the graveyard looking to create havoc and destruction. The event then culminates in the completion of a set of quests that allow you to gather ingredients to turn in for various awards. With this current season’s festivities going on, I began to wonder something. Who controls this source of undead revolt? See, the event prior to this, Mabar Endless Night Festival, one could argue that Eternity, the terrible spectral dragon, was the cause of that scenario but what about here? Izmit battling in the minions of the Night Revels in Delera’s Graveyard. Delera’s Graveyard is ripe for possibilities. We have the necromancer Dreadlord Giddeon, the lich Validus, the necromancer Valak, and the mummy Saerik Vorculas. And we probably shouldn’t limit the possibilities to those undead minions in Delera’s Graveyard. I could easily see something like the Black Abbott or Lady Vol also being a source of this uprising. However, I don’t believe this to be the case. The current timing of the event corresponds to when Mabar is closely aligned with Stormreach. This allows the undead to come out en masse and it also makes me wonder if somebody from the plane of Mabar is also the “leader” of this uprising. I’m wondering if we still have another major enemy to worry about in the future. Taking on the undead in Delera’s Graveyard during the Night Revels. I guess we’ll see what the future holds. In either case, if I keep slaughtering the undead forces in the graveyard, perhaps a revelation will occur to me :). Thanks for reading everybody and happy hunting in the Night Revels!! I’m continuing with Erdrique’s first bard life and I’m having fun making my way through the War Chanter Tree. Back in January I talked about the various enhancements that War Chanters get with respect to doing ice damage to their enemies. That post was a general description of the various enhancements that add cold damage to your attacks. In this post I want to focus more specifically on Spinning Ice. Spinning Ice is a just a fun little attack. It is basically a specialized cleave attack that not only does additional cold damage but also has the ability to do some fun and creative crowd control by having a save that monsters must pass or be in frozen in their tracks. This freezing effect even occurs on undead enemies as well as other frozen/cold/ice based monsters (I believe this is also the case with Northwind and The Frozen Fury). Nothing is more fun to see than a ice flenser get frozen in its tracks :). So far, I have found Spinning Ice to be a great complimentary attack to cleave and great cleave. I typically try to use Spinning Ice first because it is a longer cool down time than either cleave or great cleave. When I wade into a large group of enemies, I’ll hit Spinning Ice, Cleave, and then Great Cleve. I then focus on those enemies that aren’t frozen and continue to attack them with my other melee attacks, included The Frozen Fury. Erdrique using Spinning Ice in Under New Ravishment (Night Revels). The save on Spinning Ice is based on your bard level and charisma modifier as well as any stunning modifiers that you might have. So far, I have found this to be fairly effective. In a group of enemies with about 5 or 6 attackers, I generally will freeze two to three of them in a single attack. So not only am I doing damage to them, but I also stop the incoming damage coming from them as well. At least for a few seconds. Enemies will stay frozen based on your bard level (half the amount of time of your bard level) although I do believe there are some other saving throws that enemies can make to break free. Having fun with Spinning Ice in Diplomatic Impunity. All in all, it is a very fun attack. 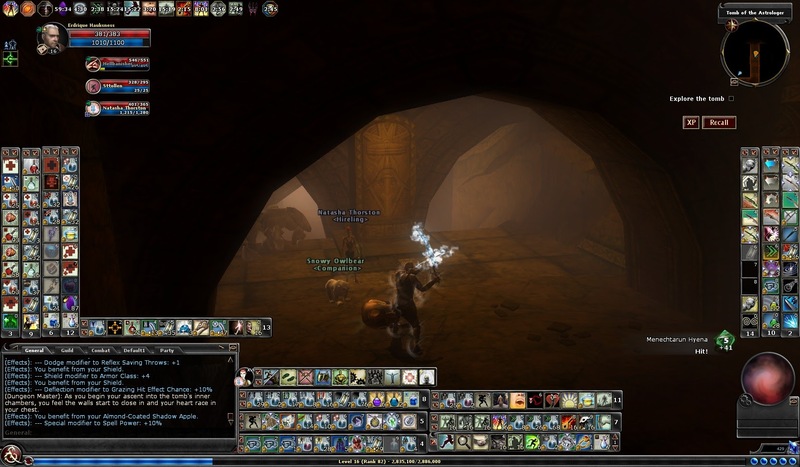 Erdrique is currently level 16 and is doing quite well with it. It is really great to find a cold based enemy and watch them freeze :).